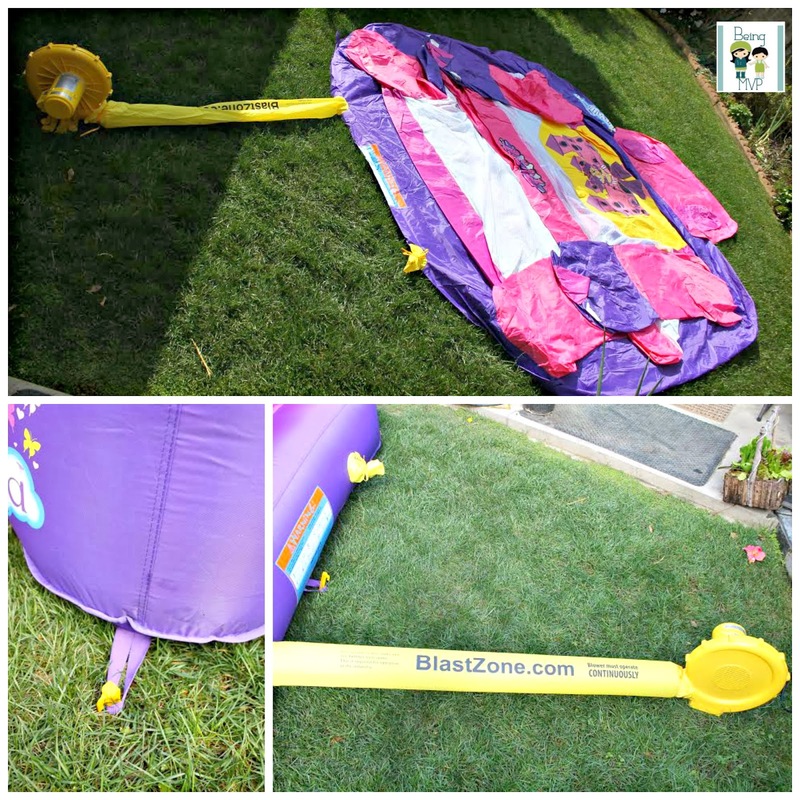 Disclosure: I received the Princess Dreamland Inflatable Bouncer for review from Blast Zone. All opinions are my own. Ever since Kenzie went to a bounce house birthday party, she has been requesting that we go to the bounce house place almost every week. They also have a bounce house at her preschool that they bring out on special days. Since she has been a bit moody lately, I was excited to show her the Princess Dreamland Inflatable Bouncer from Blast Zone. It arrived in a medium size box and I was shocked at how compact it fit inside an included bag. Since it was dark when she arrived home from grandma's, I let her watch the instructional DVD. Note: watch in private otherwise your child will be asking you for a large bouncer with two slides and a pool i.e. Inflatable Water Parks’ Inflatable Bouncers! We waited a couple of days and then headed over to the inlaws to set it up. We found an extension cord and plugged the blower in after quickly staking it into the ground with the two plastic stakes. Hubs unfolded the bounce house and I tied the tube to the blower but not quite tight enough so we had to readjust once the blower was turned on. In literally less than a minute (including user error), the bounce house was ready to use! 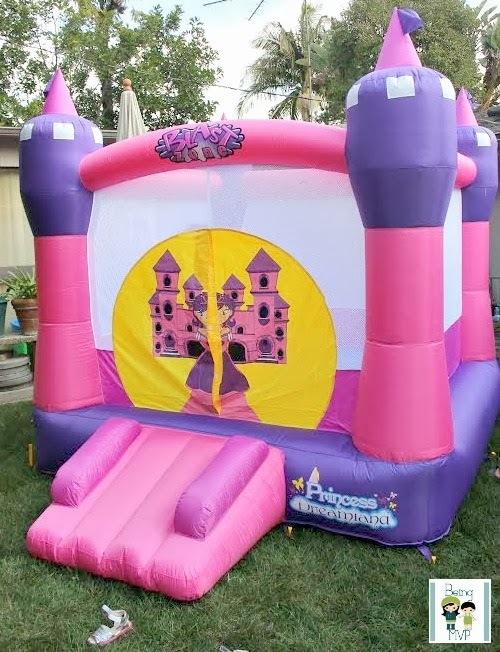 The Princess Bounce House ($349.99 + free shipping!) is perfect for small spaces (11' x 8.5' x 8') and can accommodate 3 children up to 300 lbs. It is well made and sturdy with mesh sides to allow for safe jumping. The design is perfect to use for themed birthday parties as children can enjoy bouncing for hours at your home or even at the park. Note that you need to keep the blower on at all times while the children are playing. Kenzie enjoys even sliding down the entry slide. She has so much fun bouncing and it's great exercise for your little ones. Mason, on the other hand, was a wee bit apprehensive. Perhaps because Kenzie was bouncing on full speed. I crawled into the bouncer and held him so he could get used to it. He enjoyed bobbing up and down but still held onto my hand. I think he just needs to have some alone jump time to boost his confidence. I need to pick up some sand bags so Kenzie can use this at home with the neighbor kids. To deflate and pack up the unit was a breeze. Just turn off the blower, untie from the bouncer and voila, the entire bounce house shrinks down in no time. Fold up and pack in the handy bag and you are ready to store until the next play. 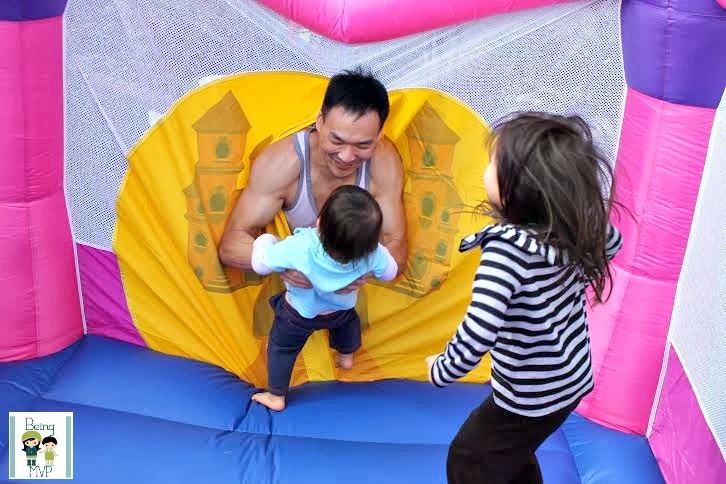 Blast Zone offers so many different bounce houses for your residential space as well as commercial inflatables. Although the cost may seem a wee bit steep initially, you will reap the rewards many times over time. It is pricey just to rent bouncers for each party (even the preschool rents theirs when you have a birthday party for your child there) so why not just get your own? Make sure to connect with Blast Zone on Facebook and Twitter! I remember these; they're AWESOME. This looks like so much fun! 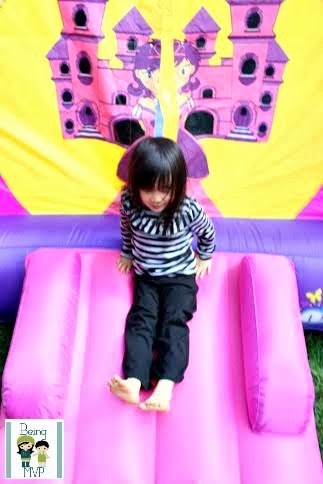 Last summer we had a block party and my toddler loved the bounce house! My kids would love this. I like that it packs compactly so it won't take up a ton of space in storage. These bounce houses are great. Not only are they relatively inexpensive, particularly compared to renting one, but the kids really love them. These are the ideal toy to have if you want your kids to be able to burn off all their excess energy and do it in a relatively safe environment. I cannot recommend them highly enough, though the pink one you have is obviously best suited for a house full of girls.